The highest honor of The Society for Organic Petrology, provided for in its Bylaws, is Honorary Membership. It is awarded to persons distinguished in a scientific discipline of significance to the Society, in recognition of their contributions in research, service to TSOP, or education. In 2005 the Honorary Member Award was named the John Castaño Honorary Membership Award. 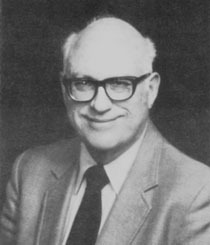 John Castaño was part of the group that led the 1983 transition of the society from the North American Coal Petrographers to The Society for Organic Petrology. Arguably the most active of the Houston-based group of founding members, John served as inaugural Vice-President, and later President of TSOP. He was an organizer of three TSOP meetings in the Houston area, and was made an Honorary Member in 1995. He served TSOP in many capacities until his death in 1997; a memorial article was published in the June 1997 issue of the TSOP Newsletter.